I am using the Watermark Creator in PhotoDirector 6 to create captions for my photos. I would like the caption to be at the bottom centre of the photo. Is there any way to ensure that the caption is exactly in the centre, rather than positioning it "by eye"? I'm afraid the formatting options for text in any of the modules in PhD are very basic. Alignment to page is not an option at all. Personally, for working with large numbers of images, I'd be using graphics software that allowed me to centre the caption with a click. If you have a Layers Module available in PhD6 (I don't have it installed), a workaround might be to load a temporary overlay grid to assist with alignment, then disable or remove it prior to export. A similar approach is possible in Watermark Creator, but the grid image doesn't automatically centre itself. I've attached some example grids that could be used. I appreciate that this is a fairly clumsy way to get around the problem, which is why I suggested using other software for the purpose. I think I'll use the "other software" option. 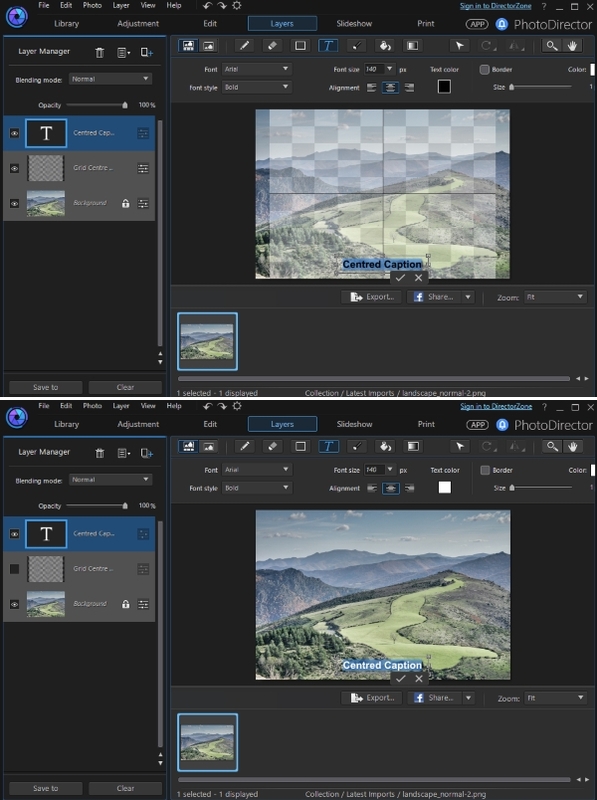 It's disappointing that PhotoDirector does not have the option of using a grid overlay - it would make several editing functions easier.